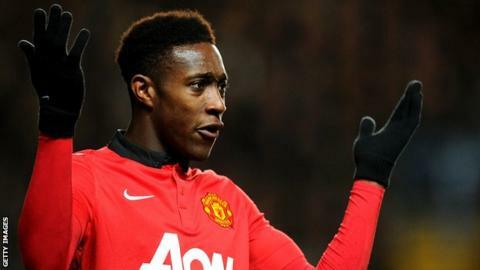 Manchester United striker Danny Welbeck is considering leaving the club. The 23-year-old, who favours a central striking role, is frustrated at being used regularly in other positions. He has two years left on his contract but is debating whether to move rather than accept a new deal if offered one. Asked about Welbeck's future after United's 2-0 defeat at Everton on Sunday, manager David Moyes said: "Danny Welbeck is really important to me and I really value him." Moyes added: "As you know, there have been a lot of stories." Welbeck scored more goals for England than United last season, scoring three times in seven matches for Roy Hodgson's side (strike rate: 0.43 goals per game), compared to twice in 40 appearances under then Reds boss Sir Alex Ferguson (strike rate: 0.05). Welbeck has scored 10 times in 32 United appearances this season and is expected to be in Roy Hodgson's England squad for this summer's World Cup. With Wayne Rooney, Robin van Persie, Javier Hernandez and £37.1m January signing Juan Mata all competing with Welbeck for a starting position up front for United, manager David Moyes is unlikely to offer him any assurances about next season. There would be no shortage of suitors should he opt to leave - although United know that the Manchester-born academy graduate is held in affection by the club's supporters. Welbeck scored only two goals last season, although one of those came against Real Madrid at the Bernabeu.